This slow growing tissue culture sport of H. 'Sagae' forms a large size (26 inches high by 63 inches wide) mound of vase shaped foliage. John Machen, Jr of Virginia. of Virginia registered this plant in 2000 and obtained U.S. Plant Patent 12,531 in 2002. The leaves have thick substance and are moderately rippled. Pale lavender flowers bloom from mid-July into August. According to The Hostapedia by Mark Zilis (2009), "The margin width of 'Liberty' differs so significantly from 'Sagae' itself that the two do not seem related...it has achieved incredible popularity." 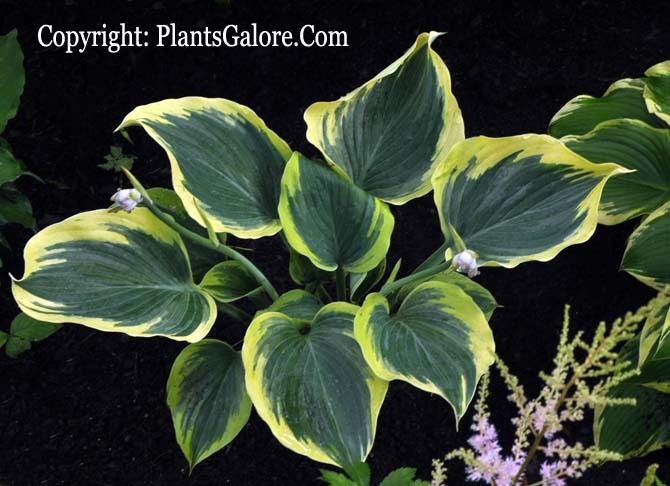 The New Encyclopedia of Hostas by Diana Grenfell (2009) states: "Slower to increase than its parents. Use as a specimen in the border,...May need extra care to achieve its potential." 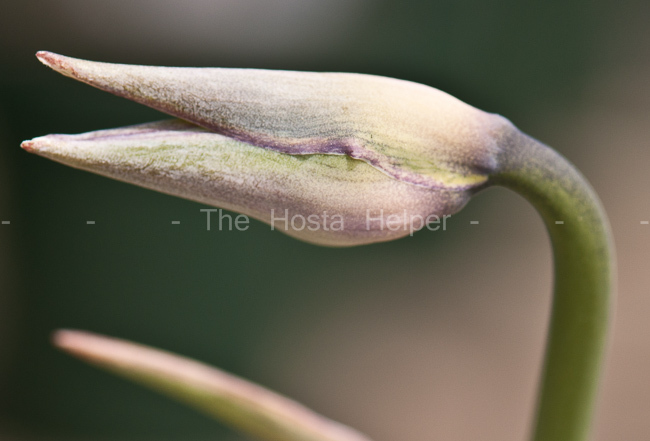 Ian Scroggy of Bali-Hai Nursery in Northern Ireland wrote in The Hosta Journal (2008 Vol. 39 No.1) about his thoughts on H. 'Majesty', H. 'Clifford's Forest Fire', H. 'Magic Fire' and H. 'Liberty'. They are similar appearing yellow-margined sports of H. 'Sagae'. He says, "...of the four, my favourite has to be 'Liberty'. It is much better for colour." H. 'Majesty' - "Of the four, 'Majesty is my best seller...The leaf detail is very consistent, with three shades of green that bleed out into the outer edge, forming almost a pale lime green margin, rather than a creamy-yellow margin...growing conditions play a big factor in the colour of the leaves...as it is late to emerge it never gets frost damage...leaf colour is muted, not as bright as the edge on 'Sagae' but the colour last on this plant much longer." H. 'Clifford's Forest Fire' - "I think the problem in the nursery trade has been what I experienced: I got two different batches in and both were different in colour and habit. The leaves were more mid-green onto olive-green centres with a yellow edge, not bright orange-yellow...Growth rate is slow and the leaves grow more flat than upwards, but very compact and tight together...The surface of the leaf is slightly shiny." H. 'Magic Fire' - Very striking, more like a zingy yellow. It really catches the eye with dark green centres that have much more veining of the centre into the border. Also the leaves are totally different from the other 'Sagae' sports: much bigger with an undulating wave across the width of the leaves like 'waves'; very unusual. The leaves are not as strong as 'Majesty'...Not good autumn colour. I'd say it's a spring hosta. Of the four, 'Magic Fire' is the most different from its parent." H. 'Liberty' - "When it emerges it is really a show stopper, with a bright orange-yellow margin with mid-green centres. Comes up very upright and unfurls slowly, which I think really intensifies the colour more to the eye, as it has more of an impact when you do not see the centres of the leaves on emergence. The leaves are heart-shaped much more than the other three but the colour and form are much more elegant. "I only know that I have not sold 'Sagae' since these four hostas came along. The only problem with 'Liberty' is it is slow like 'Sagae' and the leaves get very thin under hot weather (our hot weather is 25 degrees C [77° F], not as warm as in the USA)." 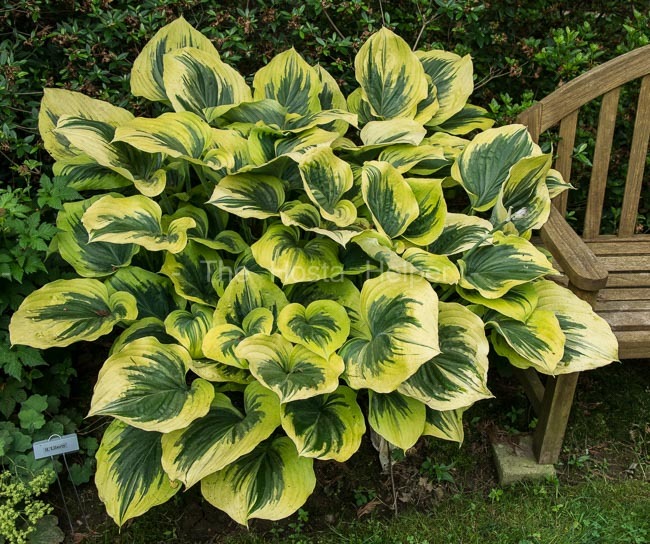 Abstract: A distinct cultivar of Hosta named ‘Liberty’ particularly characterized by its wide yellow to cream colored leaf margins, its large upright growth habit, its thick and gently undulating leaves, and pale-lavender flowers in mid summer.